This full day tour includes three of New Zealand’s most famous attractions – Waitomo Glowworm Caves, Ruakuri Caves and Kiwi House & Native Bird Park. Visit New Zealand’s most personal wildlife sanctuary and enjoy keeper talks and feeding displays throughout the day. Get up close with their large collection of native birds and reptiles, including active kiwi in a night time setting. 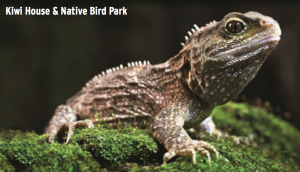 Walk through New Zealand’s largest free-flight dome aviary and see the unique tuatara, a native New Zealand reptile, which pre-dated the dinosaurs.